Port Stephens is only a three hour road-trip from Sydney’s East, and is the perfect romantic or family-friendly getaway. 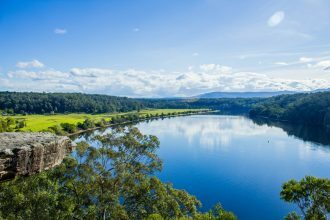 The Port Stephens region is made up of a number of seaside villages and will guarantee you a good time. Whether you’re an adventurous traveller, that can climb Mount Tomaree, or a more relaxed traveller that can indulge in the finest food at award-winning restaurants, or a mix of both, Port Stephens has got you covered. Time slows at this waterfront bar and seafood restaurant, as it’s the perfect place to have a relaxing lunch or dinner and soak in the sun, especially while eating oysters and sipping on killer cocktails. The Little Beach Boathouse boasts a family friendly atmosphere, exceptional service and specialises in fresh, locally caught seafood. The restaurant’s menu features Port Stephens rock oysters, local king prawns, and market fish of the day, along with a handful of vegetarian and gluten free options. The bar serves unique cocktails, craft beers and local wines, along with light tapas, bar snacks. The restaurant has become quite popular with tourists, as well as being a local favourite, so it’s worth making a booking if you have limited time at Port Stephens and don’t want to miss out, and trust us you don’t. This hidden, less touristy gem is worth the visit for its award-winning food and breathtaking views – be sure to get there in time to watch the sun set. Although The Point Restaurant is known for its seafood, it also offers a wide selection of vegetarian and meat dishes to suit everyone. The pumpkin ravioli is known to be particularly popular. The sensory experience of tantalising your tastebuds, seeing the sun paint gorgeous hues of pink and orange in the sky and watching dolphins jump out of the serene water, all for an affordable price, makes for an unforgettable day. So you can thank us later for telling you about it. The Poyer’s is a family-owned restaurant that’s right on the water and is nearby a playground. The menu has a French influence combined with Australian cuisine, so you’ll see everything from Eggs Benedict to Escargots. The French influence is also heavily present throughout the dessert menu which includes Tart Tartin, Praline Parfait and Chocolate Fondant. The owners are very passionate about food and making their customer’s experience relaxed and worthwhile. They are also particular about where they source their food from – the coffee is ethically sourced from 5 single origin coffees from around the world, with each origin being “carefully roasted one by one and blended soon after to create a coffee that is exceptionally well balanced.” So with the rigour that goes into their process, chances are that even if you order a coffee and a muffin, it’s going to be a culinary masterpiece. Murray’s Craft Brewing Co is situated on the widely popular and beautiful estate of Bob’s Farm, also home to Port Stephens winery (the oldest winery in the region). Explore the brewery on a world class tour, and if you’ve got little Tikes with you, drop them off at Pirate Bob’s ultimate scavenger hunt- the perfect day for young and old. Although they are most famous for their beers, Murray’s Brewing Co makes a pretty good BBQ, which nods to the great stereotypical Australian experience of coming together over a BBQ and a cold one, overlooking a vineyard while listening to live music. What a ripper of a day! With weekly live entertainment, bands every Friday and Saturday night, and a variety of ongoing competitions such as joker poker, trivia, raffles, and pool competitions, Shoal Bay Country Club Hotel is a true Australian pub experience not to be missed. Having almost 80 years of history behind them, in 2016 the pub was refurbished and as a result, given a Bondi-esque feel to it, with pastel couches and striped umbrellas showcased against the stunning waterfront. The venue is a spacious oasis, boasting sensational meals and delicious cocktails served in carafes to share with family and friends. Only recently opening in October this year, the luxurious hotel brings classy cocktails and Mediterranean and Modern Australian dishes to Port Stephens. Guests can swim in the hotel’s infinity pool or enjoy drinks at the Bannisters Tavern and Sports Bar. The family friendly pub has live music and a cute beer garden – perfect for long lunches or an afternoon drink! Let out your inner daredevil and try sand boarding! It’s a fun, unique experience that’s fit for all ages (just make sure to discuss any physical conditions with the tour agency first). 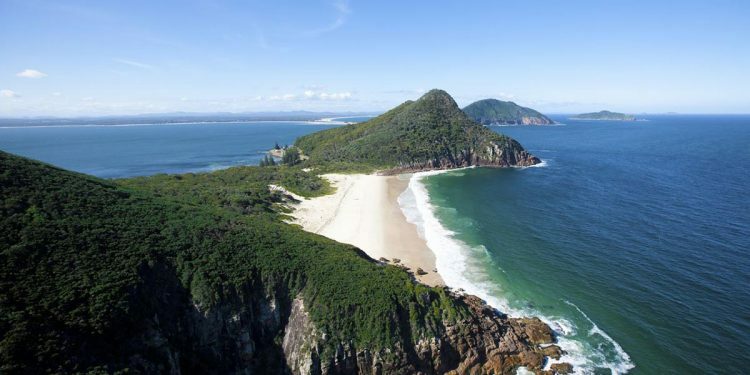 Port Stephens has a range of sand dune activities, which also includes camel and horse riding. These tours take you over Birubi Point, Anna Bay, Port Stephens beach and the dunes, which proves to be a fantastic way to explore. You can also book your tour in the evening and watch the sun set over the dunes, in the company of your family and friends. Tours are usually around $30 for an individual and group passes are subject to how many people it’s for. Dolphin and Whale cruises are a great opportunity to see Port Stephens in a short amount of time and to spot Australia’s beautiful sea life up close and personal.There’s also the chance to swim with dolphins, an incredible experience that you won’t forget. There are a number of cruises available with prices starting from $30. Time to tick parasailing off your bucket list! Unlike Skydiving or Paragliding, there isn’t as much fear when doing this activity, as you’re attached to a boat and not too high off the ground. It’s such an invigorating experience and not only is the view fantastic from above, but as you’re slowly parachuting down, you’ll notice dolphins swimming below you – it’s almost as if you’re one with them. Prices range from $90 as a solo flyer to $230 as a trio. Being quite central to all the happenings in Port Stephens, Hotel Nelson is a good place to stay. The rooms come as Standard, Deluxe Bayview, Family and Spa rooms, with private balconies and filtered views towards D’Albora Marina. There are also wonderful pool facilities. All rooms are air-conditioned, are equipped with a TV, Foxtel, a bar fridge, a kettle and a toaster. King sized beds, cooking facilities and corner spas are also available on request. On the bottom floor of the hotel, you’ll find a much loved cafe, Little Nel Cafe, serving the goods. There, you can sit indoors or outdoors, with a view of the park and Marina. If you want a luxurious stay with your partner, look no further. The rooms at Anchorage are blue and white themed to reinforce the fact that you’re near the ocean, and should surrender to its calmness. The rooms come in a One Bedroom Loft Suite, Two Bedroom Loft Suite, the Captain’s Suite, Masters Suite and anchorage villa and range from $279 – 589 per night. They all have balconies with a view of the marina, where you can breathe in the relaxing, salty breeze. You can also enjoy the breathtaking view from the outdoor pool, and bring your cocktail from the hotel’s bar with you. Guests can get a regional fresh seafood platter from The Gallery Kitchen, designed to share with family and friends or a romantic dinner for two. Taking its position as one of Port Stephens best resorts, Oaks Pacific Blue offers warm and welcoming options for families, friends and partners, including Australia’s largest swimming pool! At Oaks Pacific Blue Resort you’ll be spoilt for choice with a wide range of facilities including a day spa, gymnasium, heated spas, Japanese steam room, heated lap pool and tennis courts. The types of rooms include deluxe studios, one, two and three bedroom apartments, some with swim-out facilities, spas and private plunge pools, which range from $154 – 999. Oaks Pacific Blue Resort is close to Salamander Bay shopping centre, and is only a short drive to the heart of Nelson Bay and D’Albora Marina.